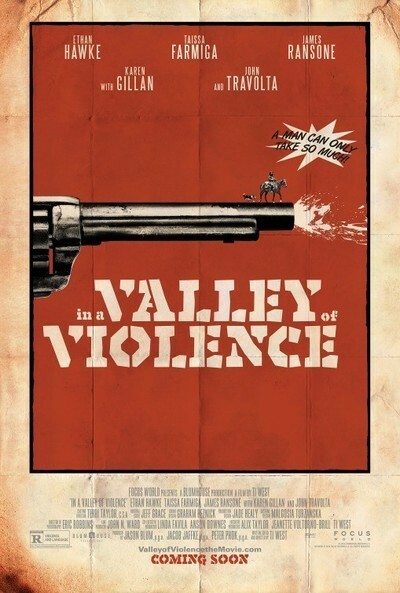 "In a Valley of Violence," written and directed by Ti West, starts out slow, picks up speed, and finally launches itself into a screwball standoff, but always with a slapstick hilarious energy. All of the Western tropes are present. There's a loner with a mysterious past and a faithful dog at his side riding into town. There's a floozy woman holed up in a hotel. There's a dusty main square. There are sneering villains, a drunk Irish priest, a young innocent woman making gaga-eyes at the mysterious loner, and finally, a U.S. Marshal, grizzled, one-legged, and ornery, representing the thin line between chaos and civilization. Headed by Ethan Hawke as Paul the loner, and John Travolta as "The Marshal," "In a Valley of Violence" does not take itself too seriously (a great asset), but it also takes itself just seriously enough that it's not empty snarky parody. The final half-hour is violent and gory, and the body count throughout is impressive, but West and his actors manage to find just the right tone. These situations are played for the reality of them, which just highlights the entertaining absurdity. Paul, stone-faced and taciturn, riding through the unforgiving desert on his way to Mexico for unknown reasons, comes across a dissolute Irish priest, and is warned off entering the valley beyond those hills. There's a town in that valley, a town where chaos and sin reins. Naturally, he heads there immediately. He needs water for himself, his horse, and his dog. The town sits in the middle of the dusty desert plain, and it's empty at first glance. The church windows are boarded up (not a good sign). People peek at his approach through their windows. Paul, while having a drink in the saloon, gets into an altercation with "Gilly" (James Ransom), a psychopath with a fragile ego who also happens to be the son of the then-absent Marshal. Paul doesn't want any trouble, but crossing Gilly brings trouble raining down on his head, trouble that leads to an act of violence that Paul cannot let stand unanswered. Then begins a cycle of revenge, each act bloodier and more irrevocable than the last. "In a Valley of Violence," in its own sneaky way, shows how ridiculous macho bluster is when unleashed with no limits. Ethan Hawke has a certain sour haunted interiority that makes him perfect for the classic Western outsider. From the second he appears, you know he has seen horrible things in his life, and done even more horrible things. He is on the run from his past, his memories. But boy, does he have an adorable dog. Abbie the dog is one of the best movie-dogs I've seen in years (running neck and neck with the dog in Jafar Panahi's "Closed Curtain"). The famed Asta from "The Thin Man" movies (and "The Awful Truth" among others) is the closest correlation to Abbie in terms of adorable expressiveness, and her ability to do numerous tricks. At one point, Abbie rolls herself up in the blanket because Paul informs her it's time for bed. She is Paul's only companion, and it is through his conversations with her, over a campfire at night, that his backstory is revealed. John Travolta, with fake leg and long straggly hair, gives one of his funniest performances in recent memory. The Marshal is intelligent, setting him apart from the lunatics who live in the town, and he becomes increasingly frustrated in his attempts to calm down the folks baying for blood. There's a great scene early on between Hawke and Travolta—where the Marshal suggests to Paul strongly that he get out of town for his own good: the scene makes it clear that they—shady pasts and all—are the only adults in a 500-mile radius. Watching John Travolta act—in material worthy of him—is always a pleasure. His character work is impeccable, and in his best work there is such a palpable sense of enjoyment on his part (I am partial to his work in "Face/Off" for this reason) that it sweeps an audience away with him. If there's a joke to be found—in a gesture, a flash of an expression, a line-reading—he'll find it. He doesn't tell jokes. He reacts to the absurdity of life. In one of the big showdowns in "A Valley of Violence," he tries to force his deer-in-the-headlights deputy to be brave, and the back-and-forth between the two actors during an extremely tense moment had the screening audience on the floor. Something happens when Travolta gets engaged with material and given circumstances. It's movie magic, plain and simple: hard to define or explain, but you know it when you see it. West's script veers between overly explanatory monologues and terrific thrown-off dialogue ("There's no women for sale here. They all left with the silver.") It's extremely violent and some of the violence is actually pretty upsetting. But West knows what's funny and—more importantly—knows how to film and choreograph events so the humor translates. It's the humor that makes the film.